Necrom taunts Rachel, but Kylun is able to drive him off. However, Feron decides to face Necrom anyways, and runs off, with Kylun following to protect him. As the two attack Necrom, they're joined by Micromax. Necrom survives their attack, but is weakened. Meanwhile, inside the lighthouse, Excalibur realizes they can combine their various bodies to form a single being, capable of navigating and repairing the collapsing realities. They reach Otherworld, home of Merlyn & Roma, but Necrom is waiting, and Rachel decides to unleash the Phoenix Force to fight him, even at the cost of her memories. The two battle in a brawl that spills out into space. Ultimately, reasoning it's more power than he can handle, Rachel sends all the power of Phoenix into Necrom, causing him to explode. A comatose Rachel then emerges on Otherworld, thanks to Roma, and Merlyn explains to Excalibur how he had carefully manipulated these events. 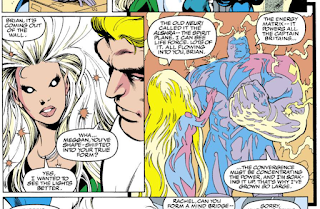 But Meggan, after Roma telepathically suggests the idea, uses the remaining cumulative power of the Captain Britains to blast Merlyn's tower, thus destroying all other towers across the multiverse, including Excalibur's lighthouse, and with it the source of Merlyn's power. Returning to Braddock Manor on their Earth, Excalibur is greeted by their friends & allies, who fled the lighthouse at Roma's prompting. 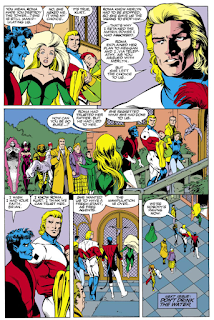 Though Nightcrawler remains suspicious, Captain Britain trusts Roma, and declares theat they're nobody's pawns now. As a result of her battle with Necrom, Phoenix is rendered comatose (and is wearing her original green-and-yellow Phoenix costume instead of her red spiky Hound suit). While she will appear in the next two issues, this effectively writes her out of the series for a little while (she remains comatose in #51 & #52); after #52, her next appearance won't be until issue #61. 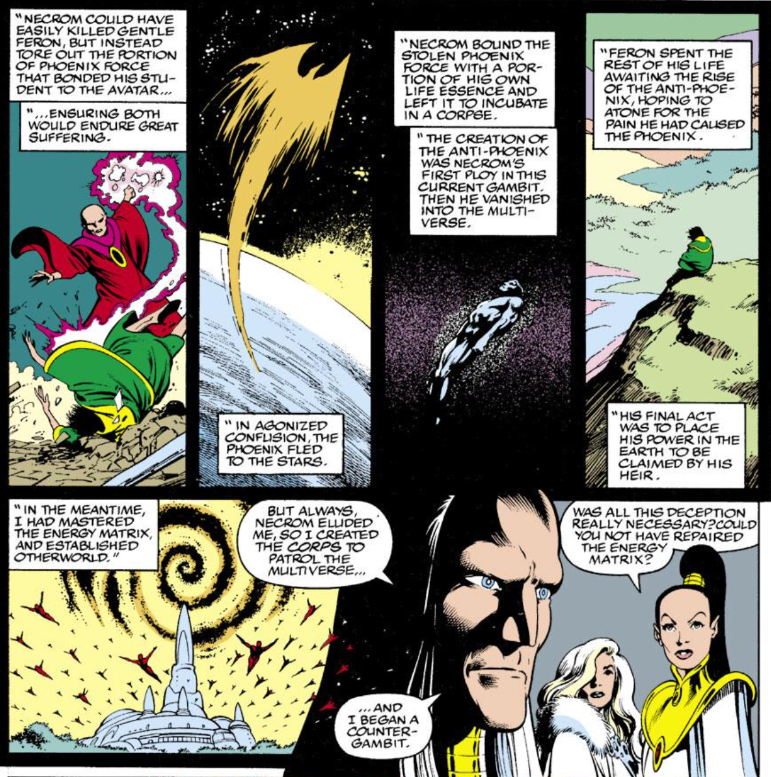 Necrom is defeated this issue, but before he goes, we learn more about him, chiefly that he was the Sorcerer Supreme of Merlyn's world, and close pals with both Merlyn and the original Feron, before he went power mad. Along the way, we also learn more backstory on the Phoenix Force, but I believe most of it has, in subsequent stories, been mostly ignored by everyone outside of Alan Davis. He'll do a more thorough dive into Phoenix Force lore in issue #52. 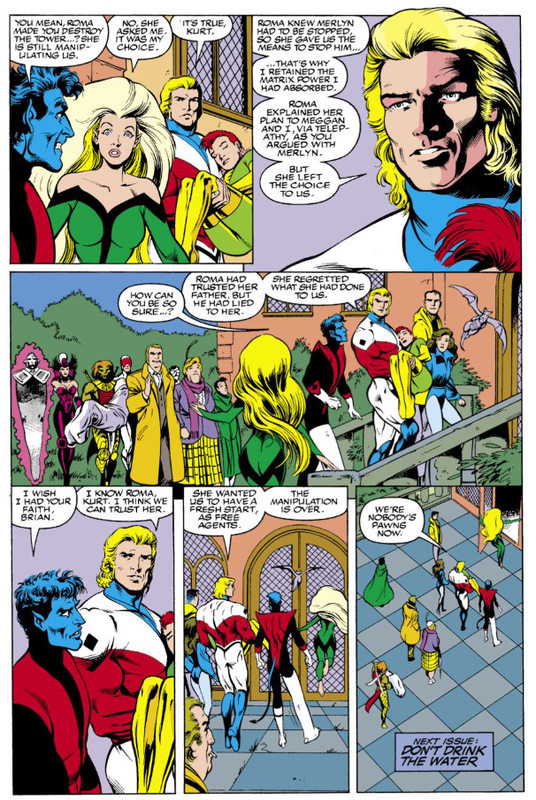 It's also revealed that Merlyn formed the Captain Britain Corp to help search for/guard against Necrom. Not sure if that's been similarly ignored by later writers. Merlyn admits that he was the Merlyn in the events of Possession, but that the entirety of that story only took place inside Alistair's head, and this never happened. He also reveals that he was the older, chess playing Captain Britain seen earlier in Otherworld. 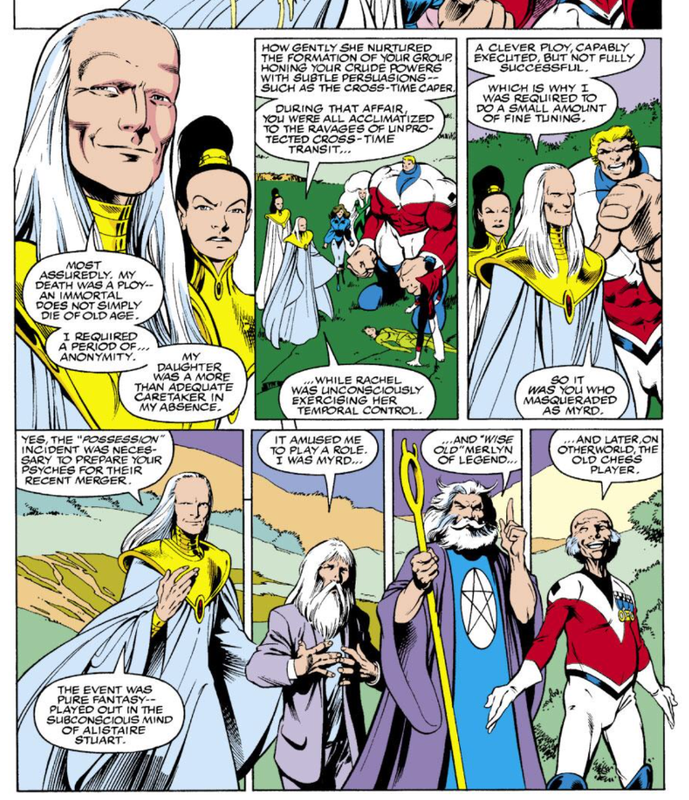 It's also said that the "Cross-Time Caper" was a means to prepare Excalibur for the events of this issue, by getting them used to interacting with other realities. 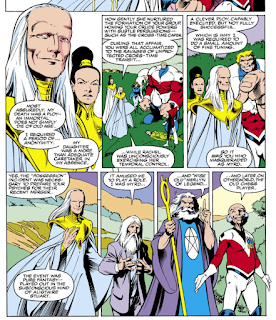 Excalibur merges into a single being in this issue (at least the original five), and it's theorized that Roma assembled them for the team specifically because the five of them, in the right circumstances, had the right powers/experiences to make the merging possible, and thus save the multiverse in this issue. Excalibur's lighthouse is destroyed this issue, as Meggan uses the combined power of the merged Excalibur to destroy the various lighthouses across the realities, thus ending the singularity and releasing the energy coveted by both Merlyn & Necrom. It marks the end of that location as the team's headquarters - they are delivered to Braddock Manor at the end of the story, and that will be their new base of operations moving forward. The first page of this issue features a pinup from Alan Davis, and is printed on thicker paper. A credit thanks Sven Larsen for the idea (presumably the idea for the pin-up). This is also a double-sized anniversary issue, though it thankfully avoids getting slapped with a gimmick cover. 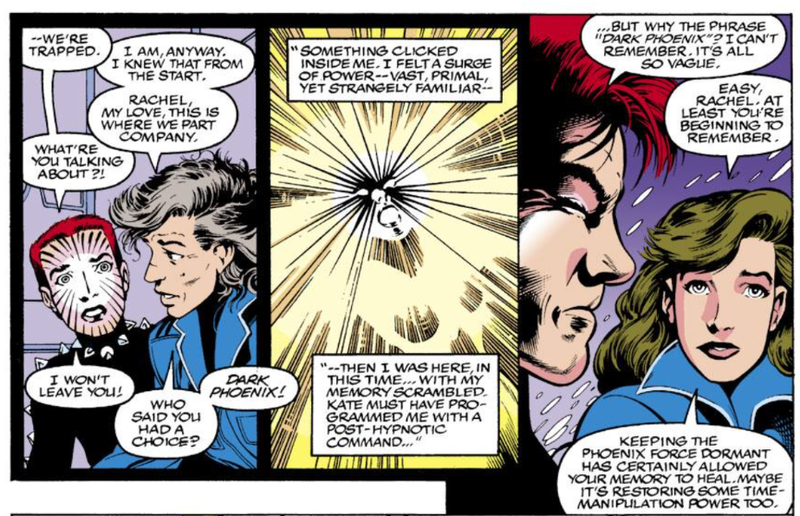 Rachel's ability to send first Kate Pryde's mind and then Rachel herself back in time is recalled, as are the events immediately preceding her her trip to the past, and the general consensus at this time is basically that Rachel must have some kind of temporal power independent of the Phoenix (but I believe Davis isn't done exploring this idea yet). 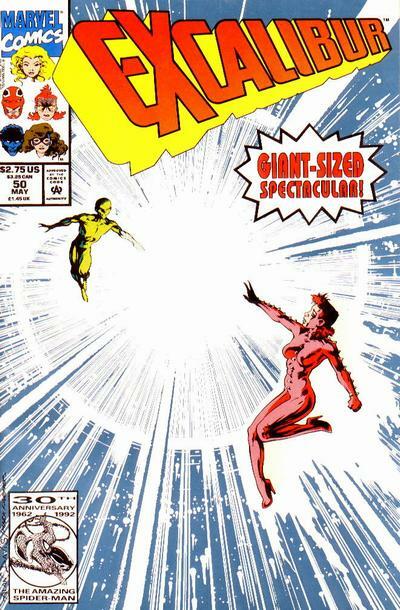 This issue confirms that Captain Britain is hulking up due to his absorption of the various alternate energies being released by Necrom's singularity. It's also mentioned that Earth-616, the Earth of the principal Marvel Universe, is the "prime" Earth in the multiverse, though I believe earlier Captain Britain stories established that idea. Excalibur's lighthouse is said to have been built by an ancient race which predates Merlyn, which I don't believe has been established before. 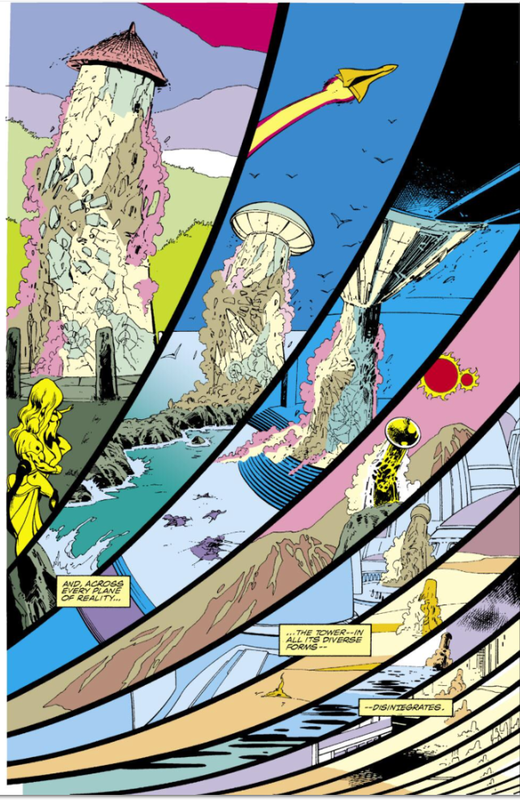 In a nice and appreciated detail, it's said that prior to Meggan's destruction of the towers, Roma issued a warning to anyone in or near the tower to get clear. The issue ends, with Merlyn's plans scuttled and the towers destroyed, with Excalibur declaring that, finally, they are nobody's pawns anymore. There's probably a ton more of these visual winks in the various alternate realities sprinkled throughout the issue, but the gathering of Superman and his Super Pets in this panel stuck out to me. Not only does this wrap-up the Necrom storyline that's slowly been building since issue #42 (but really kicked into high gear over the last few), but Davis does a pretty remarkable job of using it as a wrap-up for the entirety of the series thus far. In the process, he manages to imbue some pretty meandering and otherwise meaningless stories (*cough* "The Cross-Time Caper *cough*) with a certain level of relevancy. Intellectually, we know this wasn't the plan all along, that Claremont didn't have Excalibur wandering aimlessly through one alternate reality after another just to setup this story, but it nevertheless works, and retroactively makes some of this series' lesser moments at least somewhat more meaningful. In addition, the actual climax to the Necrom story works pretty well on its own. Davis manages to sell the scale of the final Necrom/Phoenix fight, as the pair hurl cosmic bodies at one another, and the merged Excalibur is the right kind of whacky this series does well, while also giving the rest of the cast something to do besides stand and watch Phoenix fight. 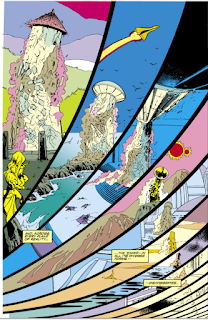 And in the end, there's not only a sense that everything thus far has been building to this issue, but also that the deck has been cleared for something new, represented most dramatically by the destruction of Excalibur's lighthouse. Phoenix (the team's most powerful and arguably problematic member) is off the board, for the time being, there's a bunch of new characters with lots of potential (Kylun, Cerise, Micromax & Feron) hanging around, the team has a new base of operations, and the characters, at least, believe they're free of any past manipulations, ready to go their own way. As both an ending and a beginning then, this issue succeeds remarkably well. Tomorrow, Wolverine #54. Next week, Uncanny X-Men #289 and X-Factor #79. I've always found this one to be a pretty big disappointment after the eight preceding issues; it leans way too heavily on exposition and wonky, contrived, "let's combine all our powers!" resolutions. Plus Davis' take on the Phoenix force has always stuck in my craw a bit. Look great, though! I'm less familiar with Davis' later Phoenix work - this mostly worked for me, mainly because it doesn't contradict yet anything we already know about Phoenix. And I was fully prepared to not like the merged Excalibur business, but I ended up kinda liking it. It fits this series in a way that, if the X-Men did it, it would definitely bug me. 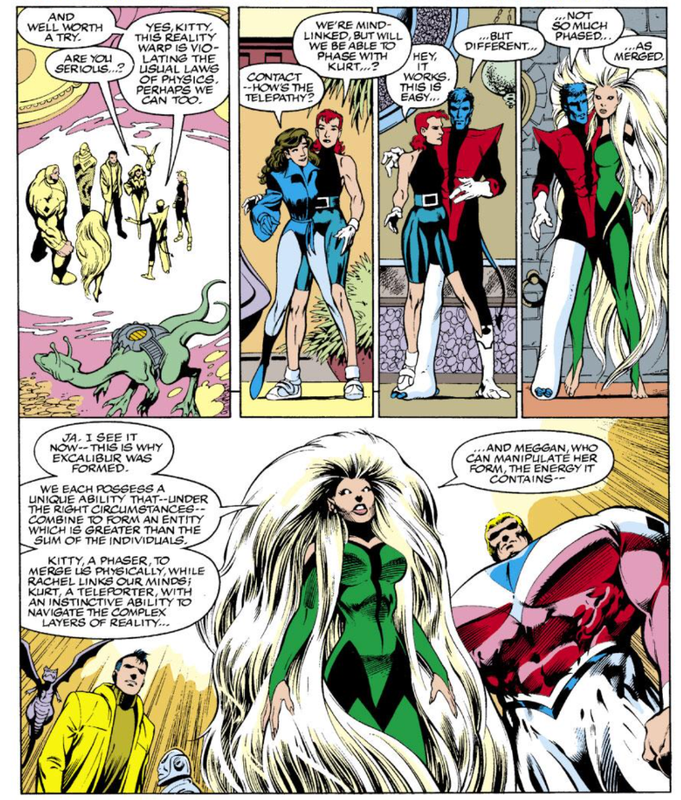 So it was her who organized Kitty and Kurt away from the X-Men, and got Callisto there too for the Cross-Time Caper. Yeah I thought the shady figure in (Davis-drawn!) UXM #214 couldn't be Mr Sinister. Actually lots of things since UXM #199 seem to build to this issue, and Spiral seems to be doing a lot for what Roma takes credit here for: she appears out of nowhere among the ranks of Freedom Force in the said issue, "Spiral Paths", where Phoenix reborns again in Rachel, and it's explicitly Spiral's 'spiral paths' by which Rachel dances into Mojoworld in #210, and Wolverine stabbing her into the gut to necessitate it follows on the tails of his serious damage in the claws of Lady Deathstrike, fresh out of Spiral's Body Shoppe and feverous mutual hallucinations of Rachel and Wolverine. 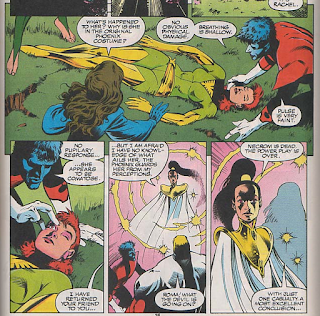 Near simultaneously Spiral and Mojo target Betsy in the NM Annual and bring her to the X-Men, so that she can die along the X-Men during the Fall of Mutants to prompt Brian also join the Excalibur. It's Betsy who recognizes Roma on crucial moment from the thoughts of Colossus, who has been healing from his Marauder-inflicted wounds and is the special pawn of Roma. The Adversary business was originally started by Forge's antics, and suddenly it feels less coincidental that his army buddies in 'Nam went by the name Marauders. I won't make an issue of his ordering 'arclight' on his location from the bombers afterwards, but it's a chuckle. Afterwards everyone thinks the X-Men dead because of Roma, who takes them to the Outback base with a computer kind of like the Mastermind in Braddock Mansion. Spiral would probably have featured heavily in the planned Rachel in Mojoworld limited series, based on the ending of #210. Rats, once again I mess my 200+ issues. UXM #213 and #209, of course. Let me stress, I'm not saying it was planned like this, but as a retcon the implications are quite horrible. But, to conclude, as the reasonable doubt of Roma's culpability has now established, the jury has no choice but to let my client Mr LeBeau go free. I tend to agree with Anonymous, that this issue is a bit of a letdown following the setup of the prior several; nonetheless, I appreciate that Davis uses the opportunity to finish tying up old plotlines and give the series a clean start to go forward. Unfortunately, the remainder of his run has way too many fill-ins for my liking, and I'm generally not as enthralled with a lot of his upcoming stories, except for the return of Sat-Yr-9. This issue blew my mind as a kid. At the time it really felt like Davis was paying off the previous 49 issues in a way that had been at least somewhat planned. Now I see the problems with it a bit more-- for instance, it's a pretty weak justification for the Cross Time Caper. Still, I love this whole run and I think this works very well on the whole..
Hey! You didn’t mention the new logo! I don’t mind it in concept but looking at it messes with my head. The angle of the letters changes awkwardly between the “Exc” and most of the “alibur”. The whole deal of beating a character who hungers for power by overloading him//her with too much power is just such a frequent, obvious trope. I’d have preferred for Rachel to leech off all of his power like he was trying to do hers — and then need to discharge it somewhere, probably, hopefully for the good. That still would’ve had the kick of her turning his own tactics on him — with concomitant angst over whether she could handle all of it without it killing her or making her go Dark Phoenix or Anti-Phoenix herself — and been at least a bit less cliché. And remarks that “every gambit has its rogue element,” which is about what passes for an X-Men crossover in Excalibur so far. The original Phoenix costume, as Kitty says, yes. Rachel’s original Phoenix costume, though? I don’t recall her in anything other than red-and-yellow, but I could well be forgetting. As we see them walk across the chessboard pattern into Braddock Manor…! I do like the clearing of the decks as you mention, although I’d probably be looking forward to what comes next more if folks here weren’t sharing their disappointment. As they say here on the internet, "YMMV." On one hand, there are a lot of fill-ins from this point for the remainder of Davis's run, but a few are plotted by Davis so they tie in at least a bit to his ongoing stories, unlike the fill-ins during the Claremont run, which usually felt like inventory issues by completely different creative teams (though we have a few of those upcoming as well). Of the remaining material, I'm not to big on issues 51 and 52 even though Davis scripts them. I really like 54 - 56 quite a bit; for me they may be the high point of Davis's entire run. 57 and 58 feature early Joe Madureira drawing the X-Men, so, for me at least, that's a good thing even if Davis only provides plots. After that point is where I start to lose interest. Issues 59 and 60 are literally two of the worst comics I have ever read in terms of both story and artwork. I felt cheated out of precious minutes of my life after I'd finished them. Then Davis is back for 61 - 67, but the two arcs are revisits to some of his later CAPTAIN BRTAIN stories which I never really liked in the first place, and to "Days of Future Past", which I tend to get really tired of seeing rehashed over and over. Anyway, that's my vague and spoiler-free opinion of the rest of Davis's run. There are certainly good bits and pieces mixed in, but overall, especially after issue 58, I feel that a lot of what appealed to me about the initial batch of stories is lost. Ah, crap, you're right. I'm really pretty terrible about that (I tend to just skip past the covers without giving them their appropriate due). 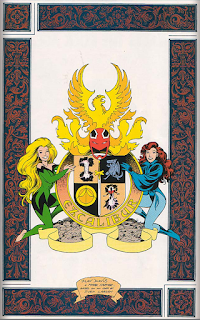 This is the logo the series had when I first started reading it, and it's pretty clearly meant to emulate the X-MEN logo, even though the series is still about twenty issues away from being tied more tightly to the rest of the X-books. Rachel’s original Phoenix costume, though? I don’t recall her in anything other than red-and-yellow, but I could well be forgetting. No, you're right, this is the original Phoenix costume, not Rachel's original costume, specifically. Sadly, I totally missed that. by Alan Moore and Alan Davis, published by Marvel UK in Marvel Superheroes, 377-388 The Daredevils 1-11 and The Mighty World of Marvel v2 7-13. Most of the backstory these issues build on are from that storyline, which is Moore's only work for Marvel. I knew the 616 designation came from Moore; I wasn't sure if he had also designated it as the Prime reality. Interestingly, I believe Alan Moore has insisted that Dave Thorpe came up with the whole "616" thing and Moore just ran with it. But none of Thorpe's issues use that designation, so it must have been a behind-the-scenes thing if Moore isn't simply misremembering. Yes, and the whole "Hey, the Cross-Time Caper was just to get you guys used to wacky shenanigans" is a re-use of Alan Moore's justification for the Dave Thorpe stories that preceded him, i.e. that Merlin wanted Brian to have experience dealing with an alternate evil reality-warping Jaspers, so that his mind would be ready to face the big-time 616-Jaspers. It's fair play, since Moore established that Merlin rolls this way, but it still is notably a copycat move on Davis' part. 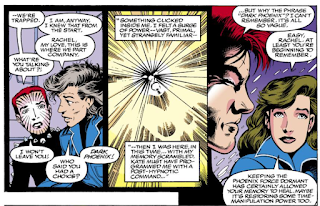 Rachel having a time manipulation power makes A LOT of sense, because your standard variety telepath generally does not do such stuff which's always been Rachel-specific. Well, up to the point when Trevor Fitzroy appeared. Rachel's perhaps more telepathic in its nature, as we've seen her only send herself and Kate's mind. Rachel kind of doing it in Claremont's TRUE FRIENDS later on (but chronologically around this time) may be noteworthy. Re: Moore copycats, it's popular knowledge that Nimrod and Adversary (maybe) were more or less ersatz Fury and Mad Jim Jaspers after Claremont had been nixed from using the characters for the Mutant Massacre. It kind of begets the question how much did he exactly rewrite his original plans, because it's kind of funny that in the end Nimrod disappeared through Roma's Siege Perilous. I just read recently -- though it was not sourced so I have no idea if it's true -- that Claremont has disclosed his actual plan for the Fury was that Nimrod would kill it and take its circuits to upgrade himself. Not sure I like this idea; it smacks of the old "Worf Effect" trope which seems lazy to me.